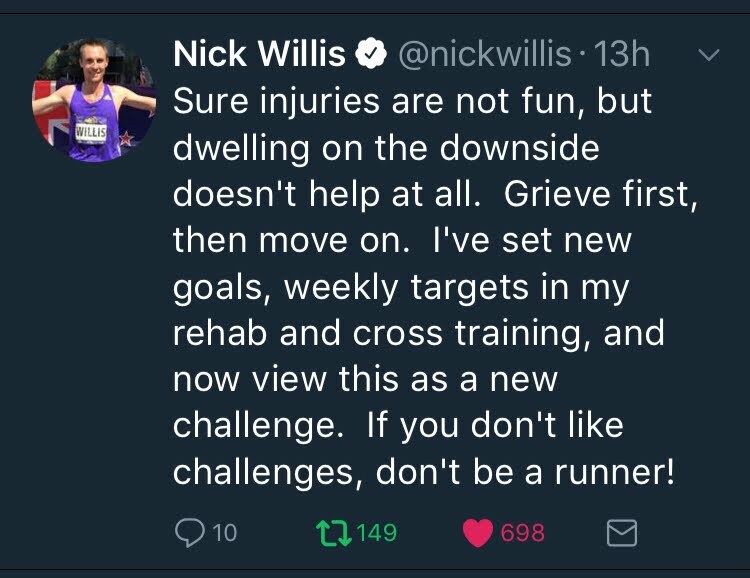 Week 2 of 12 London Marathon Build-up 5th February - 11th February 2018. Introduction of Aqua Jogging and Yoga. I started this week with a 30 minute aqua jog. It has been a while since I last did water running. I only do this when I am recovering from injury, but have always thought about incorporating into my regular routine. It has been quite cold of late so I was not looking forward to the getting into the pool. I just told myself not to be wimp and just get in, and get moving so as to not lose body heat. All things considered it wasn't so bad. I was swimming in a roped off lane sharing it with adults of all ages, all swimming in a anti-clockwise direction. I couldn't jog a full length due to the lack of depth. To help pass the time I used a bit of mathletics and calculated this to be 15m. Once my feet touched the bottom of the pool I would jog 5 metres across the lane and return on the other side . The workout was quite hard on the muscles especially the hip flexors, quads and hamstrings. I've had significantly less hip pain in the last 48 hours due to stretching of my lower right back. Following poor manual handling technique at a well know scandavian furniture store at the weekend , my back tightened up significantly. This prompted me to focus on some back stretching. By touching my toes and then wrapping my fingers underneath my feet I pulled very hard. This provided a adequate stretch to alleviate the majority of the stiffness instantly, and subsequently relieving the majority of the associated tightness to my right hip. Feeling optimistic, at lunch time I went for 4 mile run. The average pace for this run was 6:14 min/mi which felt controlled I wasn’t really paying much attention to the watch just running as I felt but the at the same time making a conscious effort not to go too fast. I completed the run feeling that I could’ve ran further. I did experience very mild hip tightness but only on slight gradients. I'm now getting to a point where I’m stimulating the upper leg muscles mores, therefore a bit more soreness is to be expected. Another trip to the pool for an aqua jog and later in the day a 5 mile runch (aka lunchtime run). My legs felt very heavy after this session, but I managed my longest run for a while of 5 miles at 6:35 min/mi. There were a number of hills in this route which didn’t necessarily do me any favours. I had hoped for somewhere flatter to run but didn't succeed, without having to double back several times. Consequently my back and right glute tightened and I made it back just before I may have had to throw in the towel. 5 mile lunch time run. I woke too a very light flurry of snow this morning. I was getting quite excited at the prospect of doing a snow run. Unfortunately, what snow there was did not settle. So I opted for another 30 minutes in the pool, with a 6 mile runch. In the late evening I attended a 45 min yoga session with my wife. I found this particularly helpful for my back stiffness and hope it will help my general flexibility going forward. I left feeling a bit taller, felt taller which is quite important to me as I'm only 5'7"! On my fourth visit to the pool this week, my routine was thrown out somewhat. I usually choose the same locker every time I visit - locker 219, my dream marathon time! On this occasion it didn't accept my token and after a few moments of frustration I tried the next locker. No, that didn't work either. Without paying much attention to the numbers I repeated this step several more times until I found a locker which worked. I settled on 209. Now that would be a fantastic time! But unfortunately a bit out of my reach! Had a busy start to the day. 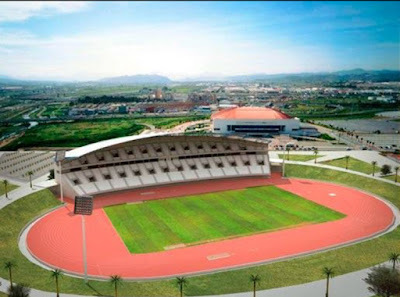 At 5:30 a.m I had parked up at the local Sports Centre and began an 8 mile run. I chose an out and back route, and upon my return I bumped into Olly Laws (ON Running Sales Director) and 6am Club training partner. We haven't seen each other for a while so it was great to cross paths. He was running in the opposite direction so we stopped momentarily for a catch-up, before going our separate ways. Hopefully after the half-term holidays I shall return to the club runs. 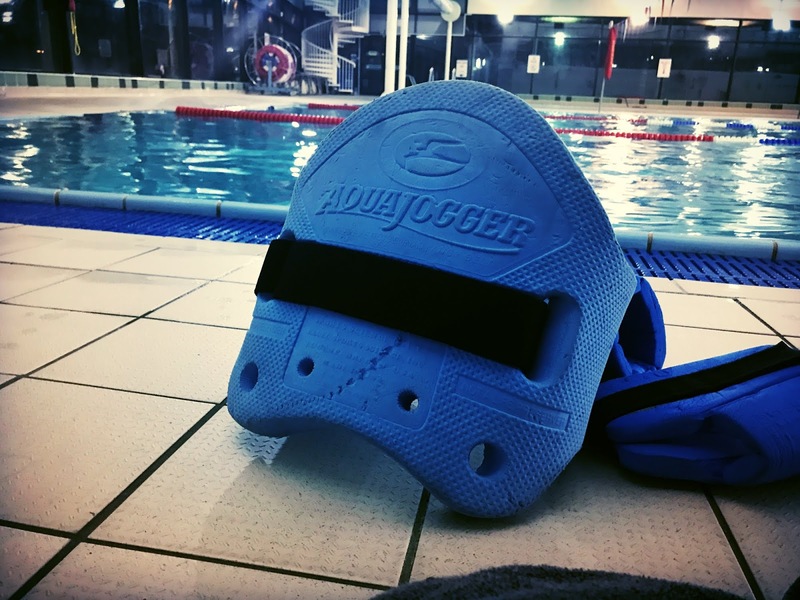 Upon arriving at the sports centre I gathered my belongings from my car and headed to the pool. I aqua jogged for my standard 30 mins, rushed to get changed as I had an 8 a.m chiropractor, before work to interview new candidates. I woke feeling quite battered from the week's exertions to date. I spent a good 45 mins stretching, and doing core stability exercises along with lots of foam rolling and spike balling. I attempted a 9 mile run and made sure I remained on a route with the minimal amount of gradient deviation. The amount of referred stiffness not pain to my hip was minimal, and did not get worse during the run. Although, I was wary within the first 3 miles. As I was sensing the end of the run I started to run quicker and actually forgot about the injury for a few moments, this is a welcoming sign. Hopefully tomorrow I can complete a 10 mile run and end the week on a high. I only anticipated running a maximum distance of 6 miles this week. 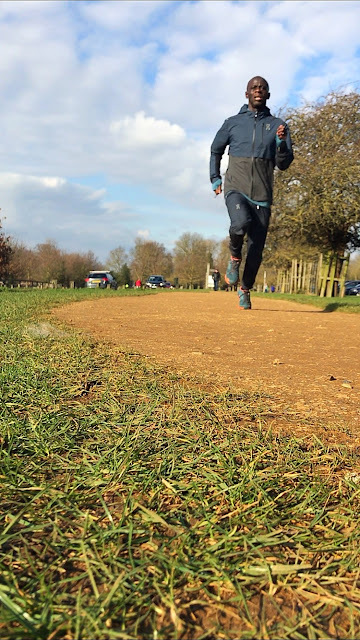 My former training partner and Team GB 2012 Olympic Marathon representative Scott Overall was competing nearby in the Valentines Day 10k. So I decided to run towards the course to see if I could catch a glimpse of the him in the closing stages. I hit the course at the 7k mark a little further into the course than I had hoped. I proceeded to run towards the finish occasionally checking my shoulder in anticipation of Scott approaching me. I managed to get to 200m to go without Scott in sight so I double backed and ran towards the approaching Scott Overall in the distance. He seemed to be moving very well as he majestically glided past me to my shouts of encouragement. He was clearly in the zone as he barely acknowledged me. 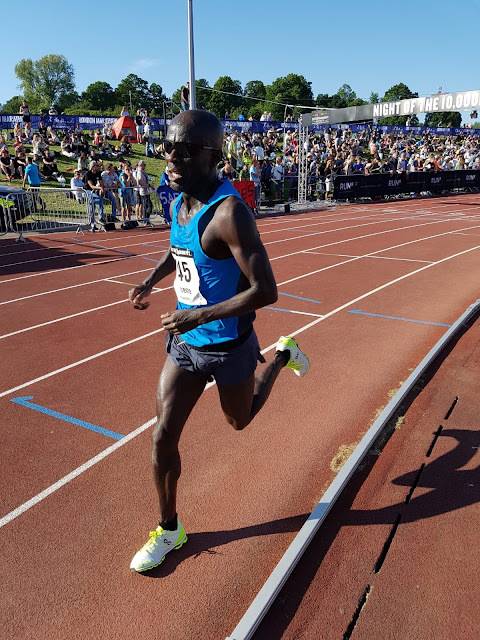 I checked my watch, it was 9:29a.m, and with a little over 200m to go he was surely on for a 30 min clocking. As it was he finished in 30:29. Very impressive solo running on this cold windy morning. I had clocked up just over 4 miles at this point on my run and continued to 10 miles. What a difference a week makes. Onwards and upwards. a.m 30 mins Aqua Jog. p.m Lunch 6 miles @6:45/mi. p.m Evening. Yoga with my wife. Visiting my daughter's school to see her receive a Governors Award for great progress in maths. 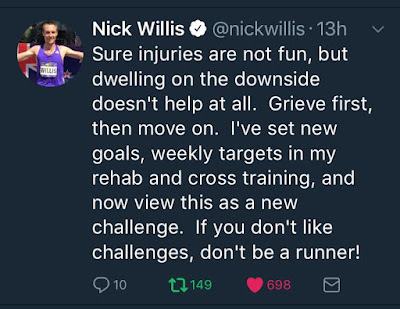 Double Olympic 1500m medalist Nick Willis' tweet about his challenge returning from injury. feel of the shoe with the original insole, which provides a nice comfortable foot bed. 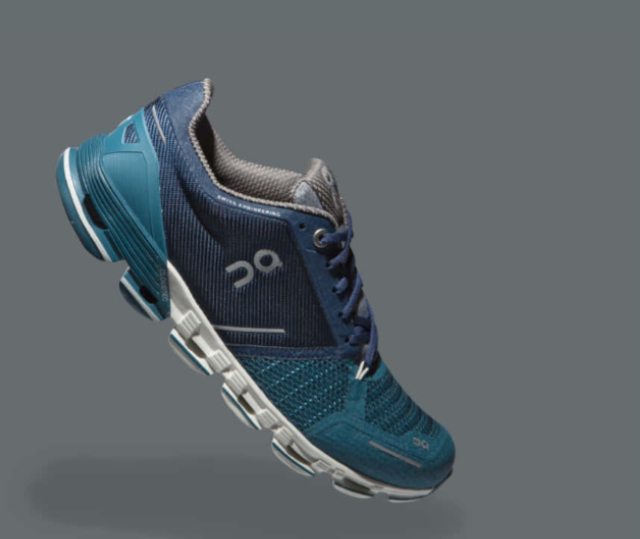 With injury prevention in mind I rotate between my own custom-made orthotics and the insole provided, so my limbs don't get use to the same distribution of shock all the time.